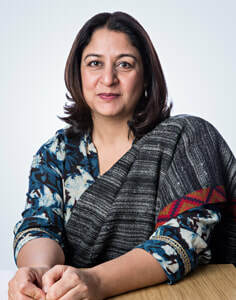 Safeena Hussain is the Founder and Executive Director at Educate Girls – a non-profit organization that aims at tackling issues at the root cause of gender inequality in India’s education system. After graduating from the London School of Economics, Safeena spent 15 years working with grassroots projects in Ecuador, Mexico, Bolivia, South Africa & Asia. In India, Safeena chose the agenda closest to her heart – girls’ education. Safeena, together with a local team, conducted a 50-school project in Pali district, Rajasthan. Post its successful test phase, Safeena established Educate Girls in 2007. With focus on enrollment, retention and learning, in the last eight years, Educate Girls has metamorphosed into a 12,000+ schools program with over 3.8 million total beneficiaries. In 2013, she received the British Asian Trust’s Special Recognition Award from HRH Prince Charles for outstanding contribution in education.